There are several ways you can help Project Linus achieve it's mission of providing handmade blankets to children who are seriously ill, traumatized or otherwise in need. Contributions can be made in the form of blankets, supplies or monetary donations. Thank you for supporting Project Linus! It is the mission of Project Linus to donate new (made with new materials), handmade washable blankets and afgans. See Blanket Specifications for details. Blankets should be in excellent condition and of good quality. Special care should be taken to insure that blankets are free of smokey smells or any chemicals which could cause problems for a child. The more colorful, the better. Please check and double check to remove all pins. 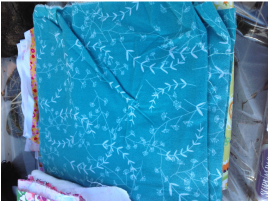 We accept donations of fleece, flannel or cotton washable fabrics suitable for quilting. We also accept full or partial skeins of yarn. No wool. We accept sewing thread and quilt batting. Clerical supply donations: We accept card stock, printer paper and postage stamps. To make a financial donation, please visit the National Project Linus website: http://www.projectlinus.org/donations. Please specify the Allegheny, Butler, Washington and Westmoreland Chapter when making a financial donation. Financial contributions are used to purchase blanket making supplies. IRS receipts can be provided.